What are all the named Mathematica styles? This question came to mind because of this answer to a recent question. Under Style, the Mathematica Documentation Center says the following about named styles. 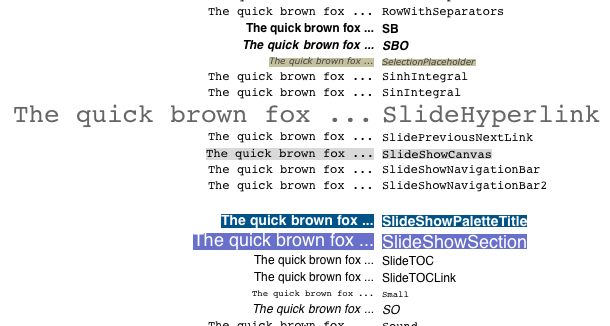 A few common named styles include: "Button", "Graphics", ..., "Title"
Altogether it lists 13 named styles, but the phrase "a few of" implies there are more. Other cell styles such as "SubTitle" and "SubSubSection" come to mind. But strings other than those naming cell styles evidently qualify as named styles. In the referenced answer, Mr.Wizard uses "TI" as a named style for the "Times Italic" font. 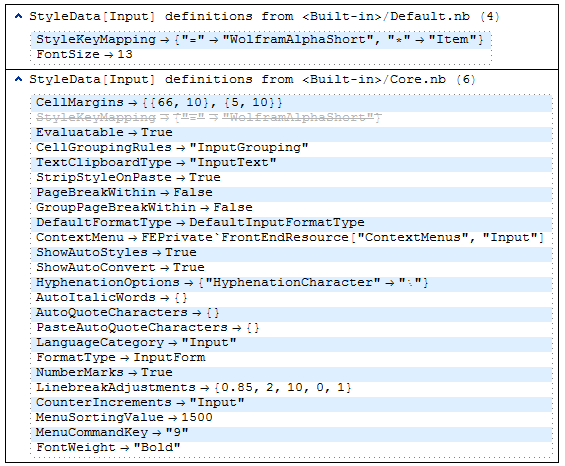 I wonder what other named styles exist, other than cell styles, that Mathematica will accept in a Style expression. I further wonder what sort of spelunking in Mathematica would turn them up. 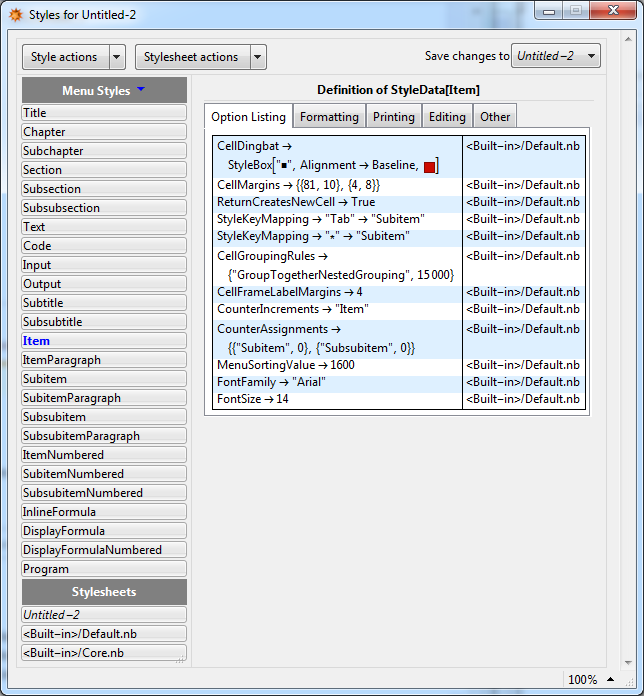 Version 10 introduced some undocumented functionality that makes it easier to explore the style hierarchy. As usual, "undocumented" === "buyer beware". This does nothing other than trigger the auto-loading of certain symbols. We'll come back to a more interesting use of this symbol later. This information is current as of Mathematica version 10.0.2, but could change at any time. Not the answer you're looking for? Browse other questions tagged output-formatting undocumented or ask your own question. What is a full list of cell styling options and sub-options? What can we do with the Dump contexts? What are \[InvisiblePrefixScriptBase] and \[InvisiblePostfixScriptBase]? When are these additional docked cell styles used? What are all the Properties that ColorData supports? What are the main differences between RawArray and PackedArray? What does the symbol Continuation do?